3 Wills Cards from the Vanity Fair Set in VG Condition. Interesting set of cards issued in the middle of WW1 - Passed by the Press Bureau. These cards are in good condition. This is just visible in photo number 5 - the card on the right, "mon droit". (Numbers 9, 10, 11, 12, 13, 14, 15, 17, 19, 21, 22, 23, and 25). Over 100 years old this lovely set is in Good/ Very Good condition. A rare Will Vice Regal Card from the Australian & English Cricketers Set, in VG Condition. 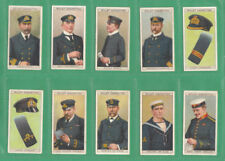 Wills Cigarette Cards - Worlds Dreadnoughts - Full Set. Condition is Used. Dispatched with Royal Mail 1st Class Large Letter. W.D. & H.O. WILLS. ALLIED ARMY LEADERS. 50 - FULL SET. PLASTIC SLEEVES. LCCC 2017 Catalogue Value. NUMBER OF CARDS. INFORMATION & ASSISTANCE. General Concerns & Further Information. Cigarette Cards. Roses By Wills Series 2. Condition is Used. Wills’s cigarette cards the coronation series. Condition is Used. Not a full set. 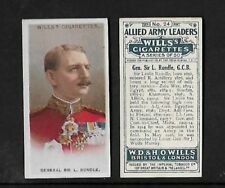 Wills Cigarette Cards - Soldiers Of The World (without P.C. Inset) -5 Cards. Condition is Used. Dispatched with Royal Mail 2nd Class Letter. Is the item in the photo the actual item I am buying?. The item in the photo is the exact item you will receive. Wills cigarette cards - MILITARY MOTORS - Full mint condition set. The reverse of the card has a good informative text. ALLIED ARMY LEADERS (WILLS 1917) SET OF 50 IN OFFICIAL ALBUM, NUMBER 3 IS POOR. W.D. & H.O. Wills. COMPLETE ORIGINAL SET FROM 1912. 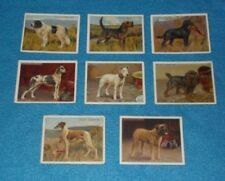 Original Cigarette Cards issued in 1912 titled. HISTORIC EVENTS. Historic Events. First and second radio celebrities books of cigarette cards complete sets in albums. Condition is Used. 1st set printed in 1934 and the second set printed 1935. I’ve taken photos of both books and a few pages in the book to show the condition. New listingCigarette cards. Wills. Musical Celebrities 1st series. 1912. A set of 50 cards. Cat Value £125. Cigarette cards. Will. Britains Part in the War 1917. A set of 24 cards. Cat Value 25.00. 16 Wills Cigarette Cards ‘AVIATION . Condition is Used. Dispatched with Royal Mail 1st Class Large Letter. A complete series of 50 cards. Issued by Wills in 1912. Roses. Good condition. Catalogued at £ 50.00 per set. Complete set of cards in good condition, a few have small marks to front or back see pictures , Housed in plastic sleeves. Wills - Celebrated Pictures Series 1 1916 - GC! Pick The Cards You Need! Wills - Arms Of Public Schools - 1st Series 1933 - VGC! Pick The Cards You Need!